Spring has arrived! It is nice to be in "the tropics" (aka West Texas) during the early spring because it brings much warmer temps much earlier in the year. And as much as I love to wear shorts, this weather is great. To celebrate the spring, we went to watch some of the great American Pastime. Not that we care too much for baseball, but it is a sport and it involves being outside. 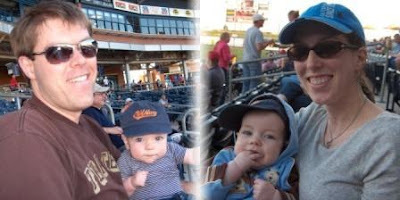 It was sad to realize that Kanyon now has been to a baseball game before he has gone to a football game. (And to compound the matter, it will be some time before he ever gets to watch football since we'll be in China ever football season.) It was great to watch the game, even if the home team didn't win (what a shame). We do plan to get out and watch more baseball before the year is up. We have to take in as many "American" things as we can before we head east. Watching the Rockhounds in action. You know you are in West Texas when the football stadium next door is 3x as large as the professional baseball team (it is Double A nonetheless). Capacity to watch high school football, 18,000. Capacity to watch pro baseball, 6,000. I am already missing my Friday night football, but for now baseball will do.